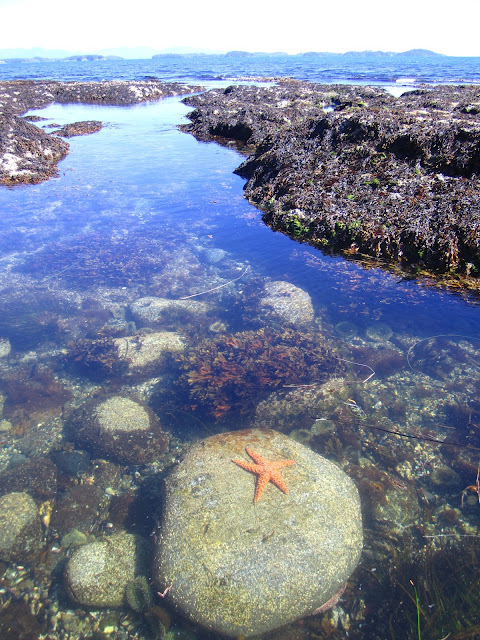 Oodles of tidal pools on the coast. I just got back from a fabulous camping trip to the west coast of Vancouver Island. Tofino is usually my port of call when I go, but this time we decided to make the less popular Ucluelet our home base instead. We camped at a private campground (something I very rarely do-I’m a “find a free and private spot somewhere in the woods” kind of girl) but that’s not too easy to find on the coast. We woke up at the crack of 5:00 to make the 6:20 ferry to Nanaimo. Yes, 6:20 AM! I’m not a morning person, but I figured we’d have to get up super early even if we wanted to catch the 8:20 ferry so we just suffered the early wake up call. We lucked out with the beautiful sunshine the first day we got to Ucluelet and spent a few hours exploring the beach in front of our most awesome campsite.. I love beach combing, and I’ve seen my share of sea stars in my life. 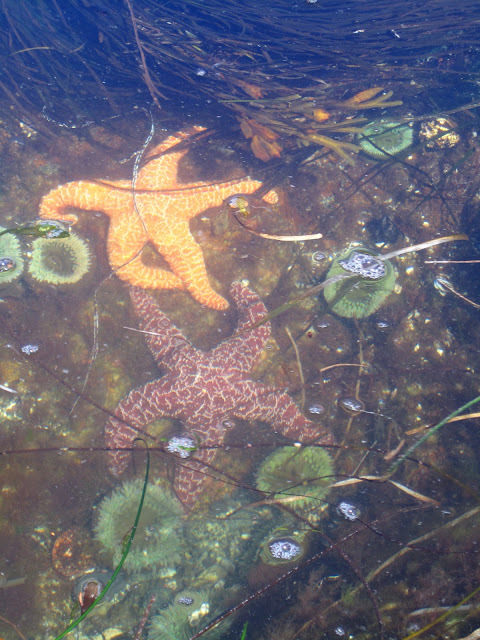 Well, the tidal pools were chock full of them, and I found a few that I’d never seen before! I’m such a nerd, but it was so exciting! I found this great website all about the sea stars of the Pacific Northwest while I was trying to figure out what kind of stars the ones I saw were. Check it out for more info! Your standard, everyday orange sea star. So simple, yet so lovely! And then there’s this beauty! Never seen one before in this shape or colour. I once kept one in a bucket when I was about five years old. It didn’t last long as a pet. This guys was a little slimy and almost looked poisonous. I touched it anyways, of course! It’s supposed to have five limbs, but this one’s a survivor! It’s Mr. Crabbs! Arrrrrr matey! I think this one is called a Bat Star. Wow, that blue star is AMAZING!!!!! I don’t think I’ve ever seen anything like it. It really is a special place – I have such great memories of being there before it was even a National Park. We camped right on the beach – it was fantastic.